When it comes to his new Quinte Online Radio station, that’s his mentality. Clark initially comes from a landscaping background. He had his own company, and he has hosted local events in the area. 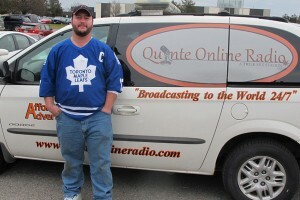 After talking on Quinte Broadcasting from time to time about his events, he liked it enough to go into a radio program. He then found himself at Loyalist College in the radio broadcasting program back in September 2010. That was when Clark thought he would love to have his own radio station. He started looking into it and talking to some people, but there was one main sacrifice he had to make in order to do take his first step forward. He had to sell his truck. Last December, he set up his studio in his garage. He set up one simple computer with music on it, a program in which he downloaded a free trial, and a radio board. On January 1, he launched his radio station officially. That is when he started one of the unique features of his station, featuring local artists. “Any local artists, as long as you write and record your own music, I can put on [the air],” he said. Clark started a “Saturday Night Feature,” which allowed those local artists to talk and perform live on his radio station. Becoming a single father of three girls, a full-time student, and operating his own station, the process got a little bit prolonged at that point. He recharged, talked with some friends, and took another large step forward. He gradually added more features, and had to learn to make format clocks and program logs. “I now know what Greg Schatzmann, the 91X station manager, has to do every day. I give him credit because they are tricky to learn and time consuming,” he said. Knowing online radio is gaining popularity, Clark continued climbing the ladder. Recently, Clark moved his set up to his laundry room. He now has an $1800 automation program on one computer, a separate computer for streaming, a sound board with microphones, and a separate internet connection, which enables him to hear what listeners hear. On top of that, he decked out a van, which cost around $3,000. “We play anything from Michael Jackson to Alan Jackson,” he said. And he now has companies interested in advertising. The next step is to reprogram his song schedule a little more, having a little less repetitiveness. In the future, he hopes to upgrade to an actual station after those minor tweaks to his online version. 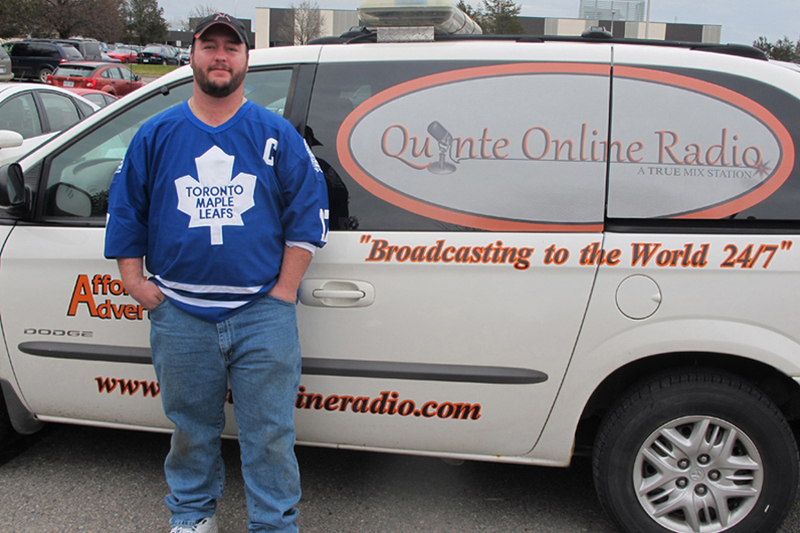 He then hopes to broadcast live at Radiothon events, which raise money for Quinte Healthcare. He will be able to do this by controlling his automation computer at home by remote connection on his laptop where ever he is located. Essentially, all he needs for that is a place with an internet connection, the software, and a microphone to connect to his laptop. That may open the doors to not only local advertising, but national or perhaps international as well. When it comes to time management, how does Clark do it? “When the girls go to bed, that’s Daddy’s time to buckle down and get [my work] done,” he said. Clark remains patient, and understands he needs to walk before he can run, but he is well on his way to running. “Livin’ the dream,” he said.